SIL LEAD is dedicated to helping communities use their languages to improve their quality of life. One way that we do that is by helping children learn to read in those languages. We are not the only ones engaged in this work, and this post, the last of three, will compare the International Children’s Digital Library (ICDL) and the African Storybook Project (ASP). To fully understand the uses of the International Children’s Digital Library (ICDL) and the African Storybook Project (ASP), it helps to compare them. Their biggest difference lies in their goals. ICDL focuses on providing quality multicultural children’s literature. ASP focuses more on quantity, making a larger volume of literature available in under-resourced languages. 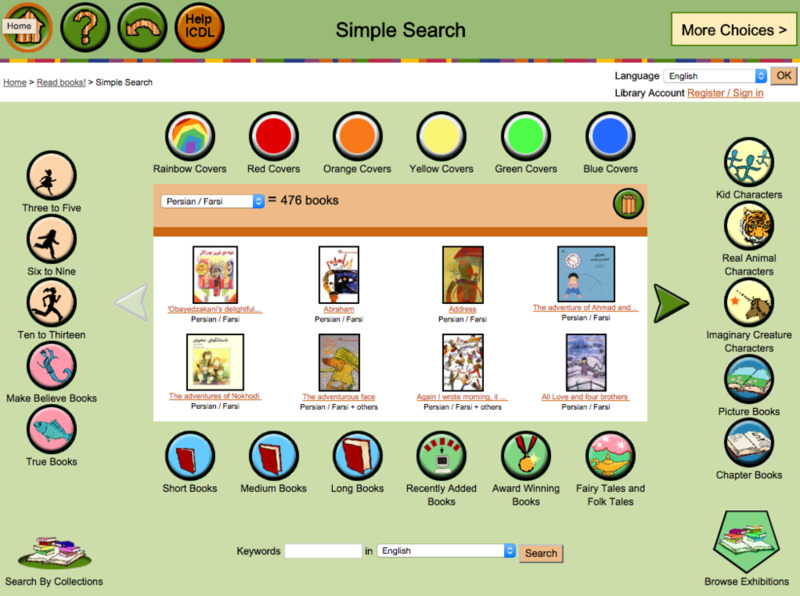 Search options in International Children's Digital Library. Another large difference is in the user interfaces. ICDL contains multiple ways to read, allows users to layer searches, and offers its interface in six different languages. The interface for the ASP is functional but still under construction. Users can search for books by language, type of story, and text level. Currently, there are about 4,619 books in the ICDL, and about 2,412 in the ASP. While numbers are impressive for online collections, they are only a fraction of the 12,000 books available in a typical American school library. However, ASP’s collection is growing rapidly, with the number of texts increasing by about 70% in as little as four months. Because of the emphasis on quality, ICDL’s collection is growing more slowly, and activity on the site dropped precipitously after 2011. Still, both collections provide reading material for students that might otherwise have trouble getting reading material. Such students include Lumasaaba-speaking children in Uganda, who can now access 69 books on the ASP website. It also includes American students who speak Farsi with their parents, and who can now access 476 books on the ICDL website. 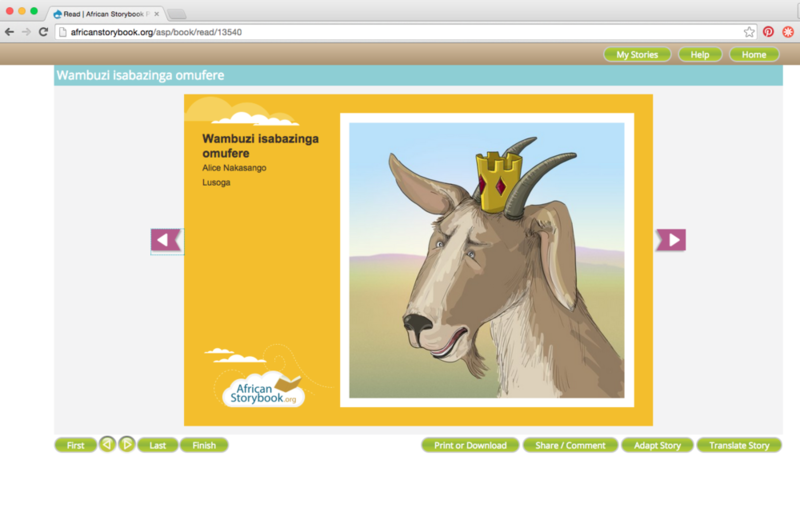 An example of the reading view on African Storybook Project. Getting books into the hands of children who need them most is still a challenge. Many children who need reading material the most have the least access to computers. ICDL contains copyrighted material, so nothing on the site may be printed or distributed. It is encouraging that ASP allows all of its materials to be downloaded for printing and other forms of distribution, but it is still a concern that books are only formatted for digital reading. In order to print and bind books well, users must reformat the pictures and text themselves to fit into the layout that they want. ASP is also using memory cards to distribute materials for reading on cell phones, which are popular in Africa. The project also suggests that the books be displayed using projectors in school classrooms, which may be more affordable than printing books for classroom use. You can read more detailed descriptions of the two projects in the first and second parts of Children Need Books series.